Some astute modifications have enabled the inhabitants of this home to linger much longer. 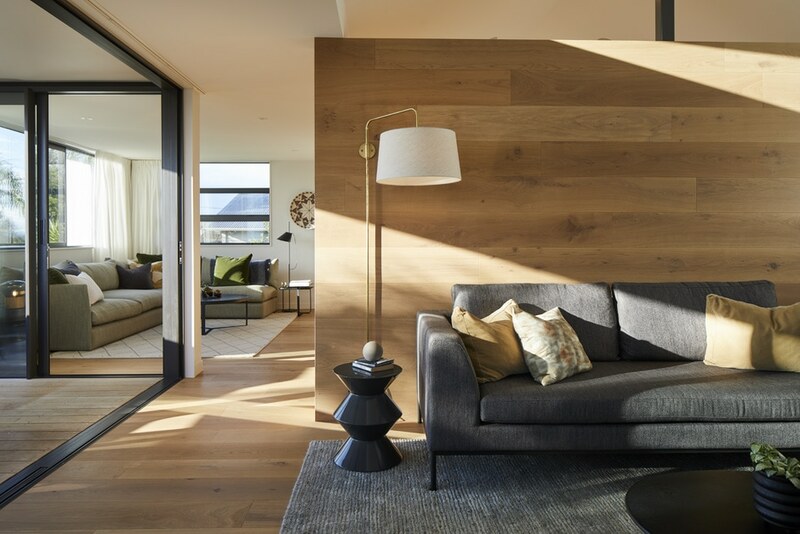 In Auckland, a sea view provides a compelling reason to stay right where you are, so when Nicole McKenzie and Dave Glackin decided they needed a change, it made sense not to move house but to update the one Nicole designed and built 10 years ago in the beachside suburb of Pt Chevalier. 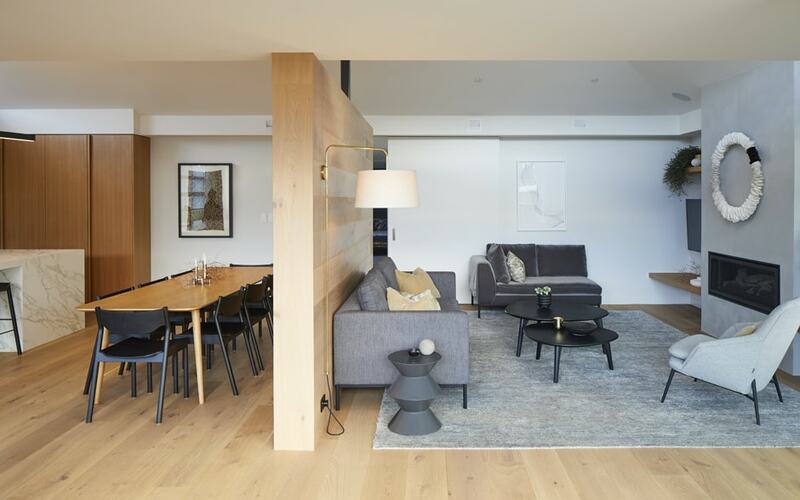 “We’ve always loved the orientation and fundamental floor plan of the house, and going through the process a second time allowed us to tweak the original design to enhance it for our family’s evolving needs,” says Nicole. 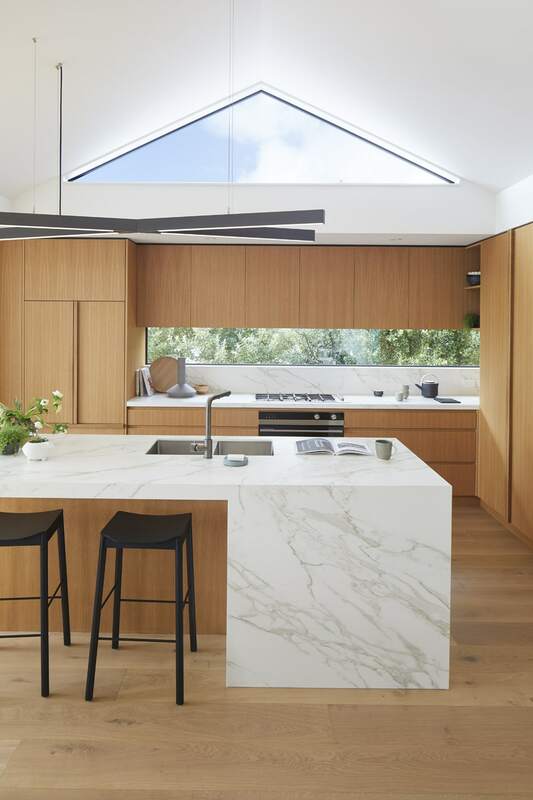 ABOVE The kitchen’s oak veneer cabinetry by Central Joinery is teamed with a Neolith Calacatta benchtop and splashback from SCE Stone & Design. Overhead is a pendant light by KKDC, and on the wall beside Nicole and Ollie is a handcrafted basket from Collect Living. 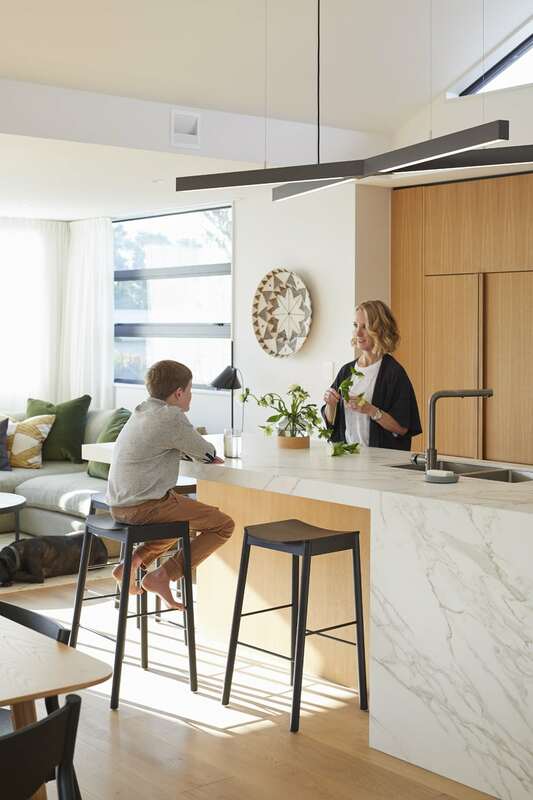 To help her narrow down the options, the couple brought on board one of Trinity’s senior designers Jayne Tolley and architect Jason Bailey, who oversaw the structural changes that needed to be made. 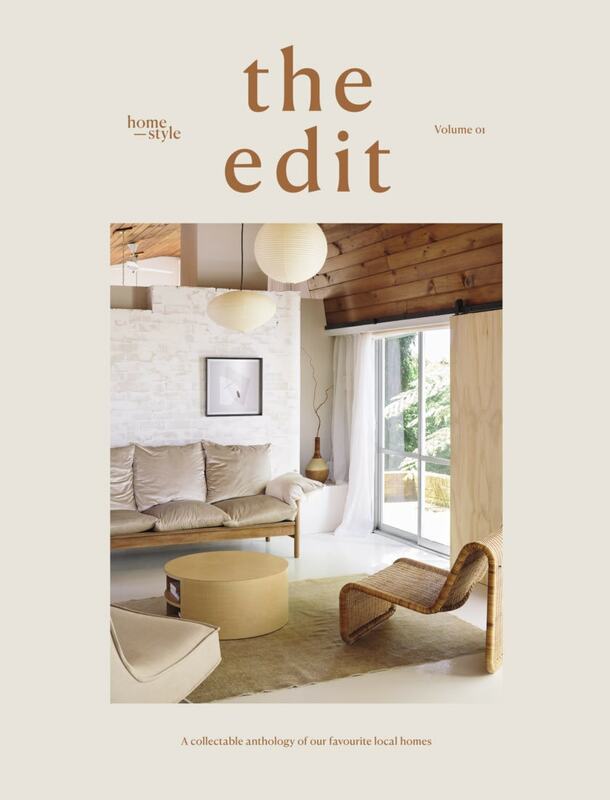 The key element in their brief was bringing the overall mood of the home up to date by creating warm and inviting spaces layered with tonal, textured finishes. “We don’t like clutter or busy interiors, and a sense of simplicity without austerity is important to us,” says Nicole. Although there were a few roadblocks at the beginning of the project, thanks in part to variations and amendments required by the council, Nicole forged ahead to allow plenty of time for the design process. She knew full well that locking in fixtures, fittings and finishes early on would enable the construction and install phases to run smoothly. TOP Nicole had this sofa reupholstered in Mississippi 19 fabric by Lizzo from Westbury Textiles. The lamp is designed by Trinity and made by Jimmy’s Handbuilt, the Crescent coffee tables are from King Living and the Ritz Luxe rug is from Source Mondial. ABOVE An oak-panelled partition divides the kitchen/dining and living areas; in the former is a solid-oak dining table designed by Trinity and made by Classique, with Tangerine chairs by Simon James. The framed work on the wall is a keepsake from Nicole’s travels in Africa, while the art in the living area is by Jane Mason. The Hug chair on the far right in this space is by Wendelbo from Bauhaus. The boys live with the couple part time and share a downstairs bedroom that now has a new ensuite. With direct access to the front courtyard and pool, it sees them downstairs for hours at a time, hanging out with their mates without disturbing the peace upstairs. Also downstairs is a serenely decorated bedroom affectionately known as “Mum’s room” – a dedicated space that’s used by Nicole’s mother when she comes to stay and sits opposite a luxurious new bathroom. 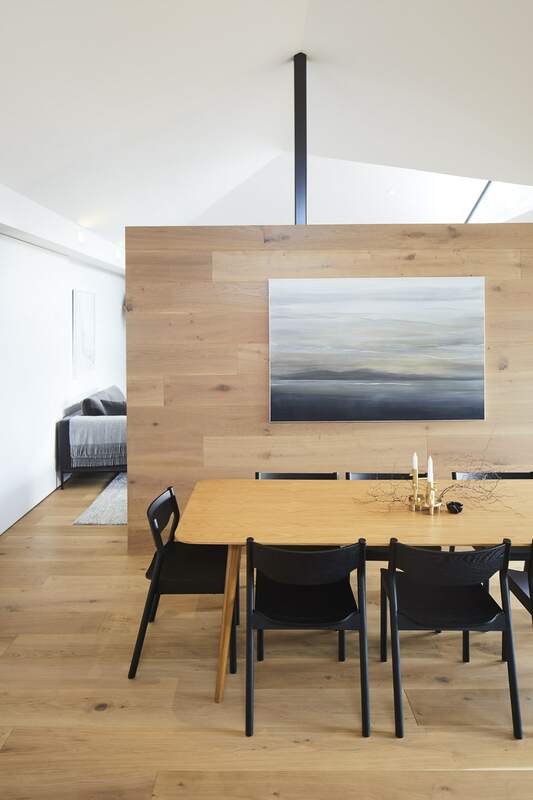 The downstairs entry to the home is through a light-filled hallway with a double-height void. Slate flooring was installed here atop the existing polished concrete, and its grey through to black tones add some of that desired texture to this space. 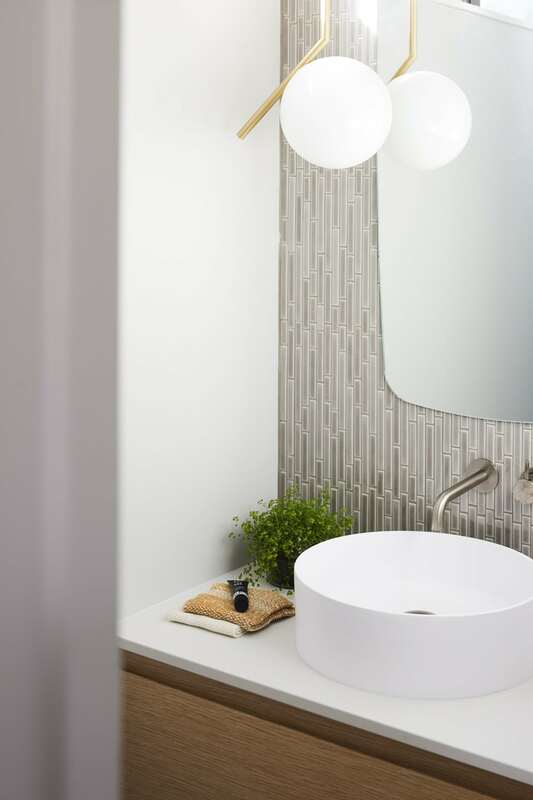 TOP An IC pendant by Michael Anastassiades adorns the bathroom, along with light grey mosaic strip tiles from Artedomus. 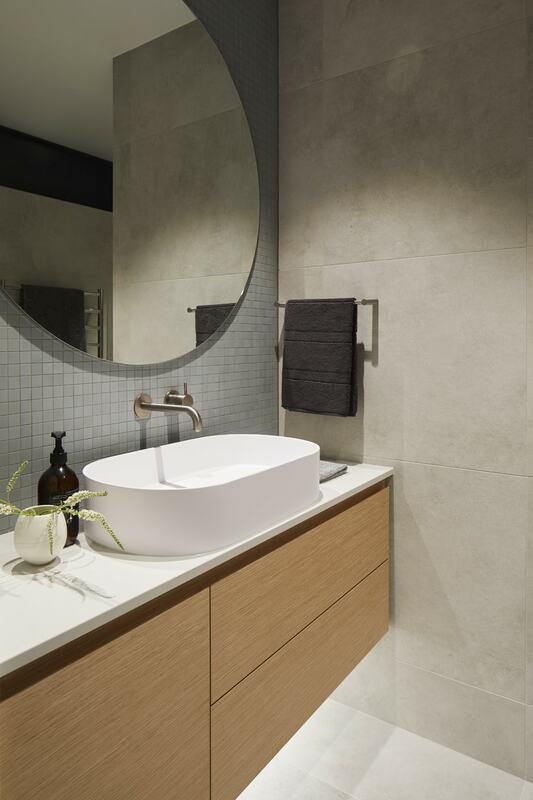 ABOVE MIDDLE White Maps tiles from European Ceramics line the walls in the downstairs bathroom, which has a chic recessed shelf above the Justina freestanding bath from Stonebath. The stool is from Soren Liv. 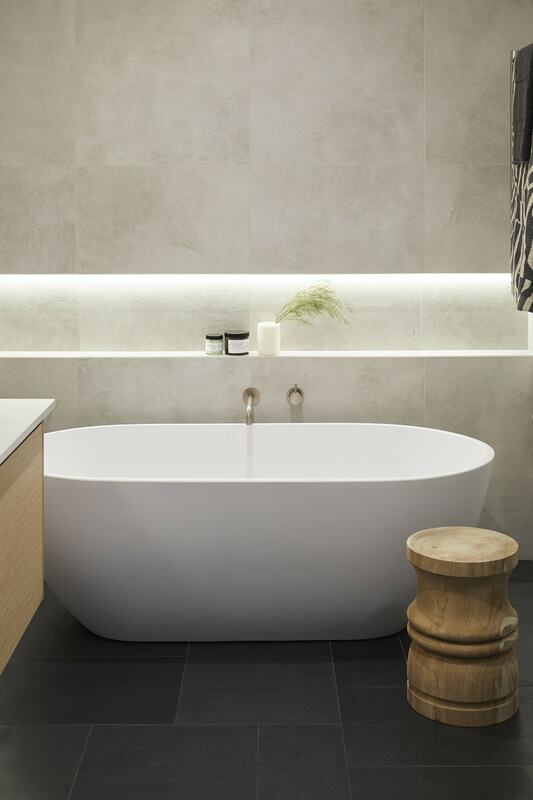 ABOVE The boys’ ensuite features Cinca moasic tiles from Artedomus, and a vanity custom-made with a S3 stone basin from Stonebath, a Caesarstone Fresh Concrete top and Laminex Sabia Rigato timber veneer panels. But upstairs is where Nicole’s vision has really come into its own. 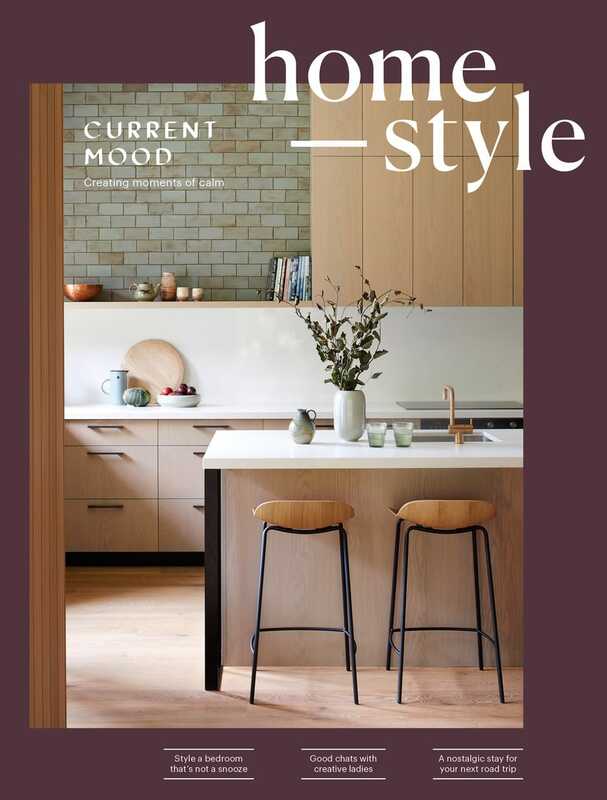 Honey-toned oak floorboards extend throughout the living areas, and this same timber features on the panelled part-wall that cleverly divides the kitchen/dining and living areas, creating a sense of intimacy within the open-plan space. The kitchen’s timber cabinetry blends in seamlessly, framing a horizontal window above the bench for a lovely leafy outlook. MASTER BEDROOM This space is all the more inviting for the feature wall behind the bed made with Elitis Madagascar wallpaper from Seneca. 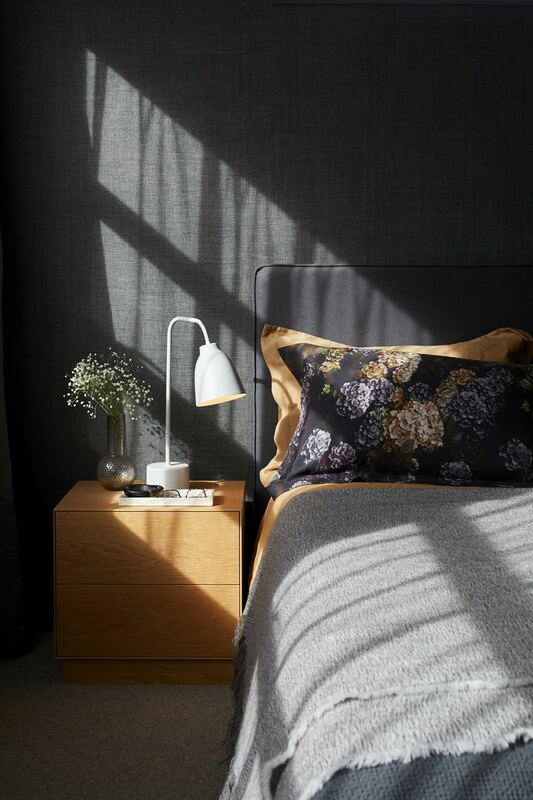 It’s combined with a headboard designed by Trinity and made by Siba Design, bed linen from Thread Design, throws from Siena Society and Stansborough, Seam drawer units by Simon James and Caravaggio lamps from Cult.